A grand jury failed to indict the officer, who was filmed throwing the girl to the ground as she lay screaming for her mother. The Texas police officer who was caught on camera aggressively manhandling a 15-year-old Black girl in a bikini at a pool party in 2015 has been hit with a multi-million dollar lawsuit. 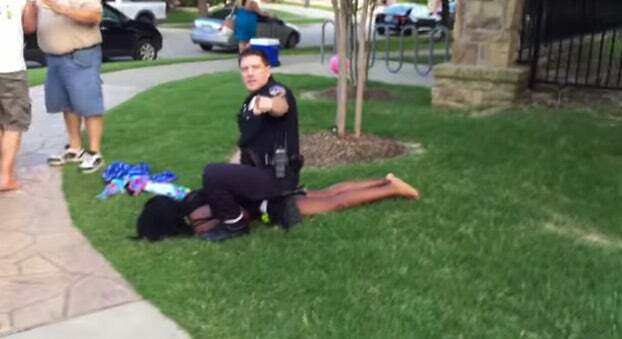 Video footage of the incident, which occurred in July of 2015, showed Dajerria Becton being pinned down by former McKinney police officer Eric Casebolt as he attempted to disperse a group of teens while responding to a call about a disturbance at a neighborhood pool party. In the most disturbing portion of the 7-minute clip, Casebolt is seen dragging the girl from the grass to the sidewalk before attempting to pin her head down on the pavement. He then grabs her forcefully by her arm and throws her on the grass again, slamming her head down as she continues to scream hysterically and demand someone call her mother. The encounter between Becton and Casebolt begins at about the 3:50 mark in the video. According to the Dallas News, Becton and her legal guardian maintain that detaining the teen without probable cause and the use of excessive force violated her constitutional rights. Becton told officials she was in the process of leaving the pool party as instructed by officers when she was approached by Casebolt. In addition to Casebolt, the complaint faults the McKinney Police Department for failing to provide adequate training for their officers. Although Casebolt resigned four days after the incident, a grand jury ultimately declined to pursue criminal charges against him. The civil suit filed by Becton and her guardian also states that the actions displayed by Casebolt are representative of a larger issue within the McKinney Police Department. “There exists a practice of excessive force incidents that result from the training or lack thereof, received by MPD officers,” the lawsuit reads. The teen says she continues to suffer from both the physical injuries and psychological distress caused by Casebolt’s assault. In lieu of a lawsuit, Becton previously proposed a settlement with the city last June, in which they were to pay her $2.5 million in damages and agree to train their officers how to better handle the use of excessive force, confrontations with juveniles, and racial sensitivity. The city reportedly rejected Becton’s initial offer in its entirety. Becton and her guardian are seeking $5 million in damages for loss of quality of life, mental anguish, and attorney fees.